WeatherCat V3.0.1 is now available. This is a small update to fix an issue with high CPU usage that may happen on some installs if the webcam is not in use. Alternatively, if you are running WeatherCat V3.0.0, you can wait for the update notification within WeatherCat. If you can't wait, you can hit the 'Check For Update...' menu item in the WeatherCat menu. Thanks Stu for spoiling us with all the neat toys! . . . 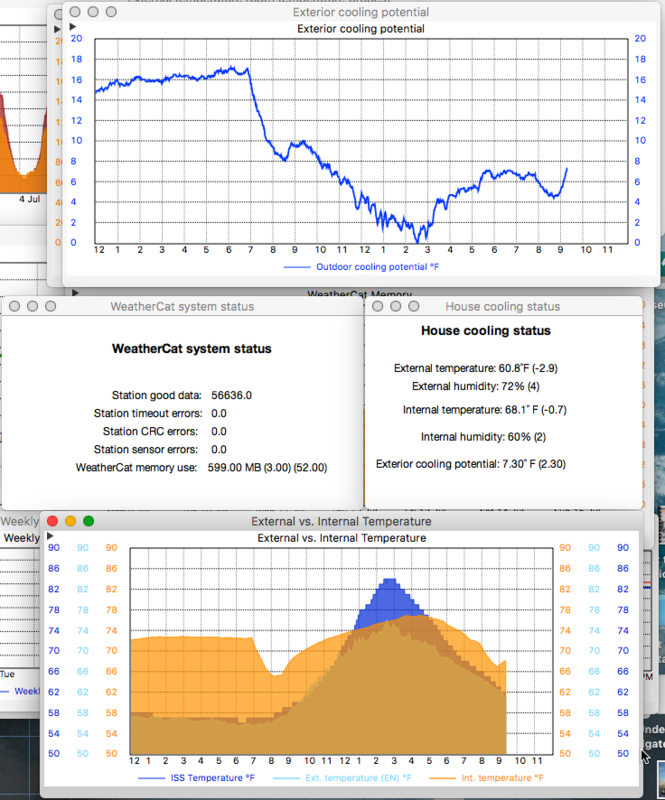 I have both updates installed and am running WeatherCat on macOS 10.12.6. Thanks for these updates Stu. Nice work. Dear WeatherCat "addicts," . . . . It sure hasn't taken me long to become completely dependent on Custom Text Windows. How did I live without them for so long? Thanks Stu! As always, you rock! As you can see, over the previous weekend WeatherCat memory growth was quite rapid. Monday afternoon into Tuesday I restarted WeatherCat a few times until I finally resolved the problem with my WC AppleScript Tags Processor script. WeatherCat has been running now for almost 3 days and it is no where close to the 750 MB of RAM it was using over the weekend. So those of you lagging behind as I was, perhaps it is indeed worth the trouble of upgrading to High Sierra after all. I know you miss the good old days running on Puma but glad to see you using something a little more modern. Good to see you moved up to High Sierra, Edouard. Does that mean Stu gave the general OK to run WC on High Sierra or did you just decide it was probably time since several forum members reported the WC work-around sufficed? I leave for an out-of-the-country trip in a few hours so I'm going to miss the early adopter switchover to Mojave. I haven't had any problems with WC on Mojave for the past several builds but we've seen this is somewhat dependent on the hardware configuration. Good luck to everyone trying WC on Mojave on their particular machine. Suggest having a (verified) bootable clone before you start down that rabbit hole if you're running WC on your main computer. This may still be is a ßeta, so use with appropriate caution. WeatherCat 3.0.2 is a beta build that is still under development. It addresses a few issues that do not trouble all WeatherCat users, including a work-around for those of us whose hardware exhibits a macOS High Sierra bug that causes WeatherCat (and at least one other app) to freeze whilst the lock screen (requiring a password to login to the computer after the display has gone to sleep) is engaged. This bug only manifests itself on certain hardware and is not widespread. This build is still in development as Stu is documenting the bug to Apple engineers and tweaking the work-around. Thanks, Blick, that topic didn't show up in my search. I vaguely remember it, however. I think I installed it when I saw the option in the topic I listed. At any rate, it shows how responsive Stu is to reported problems and is skill at working around OS bugs. I am also on 3.0.2 because the 2 version also fixes the major bug about Gauges not appearing on the website.